News that a Wichita-based company is moving to Colorado sparked a round of Kansas-bashing, most not based on facts. One reader wrote “Yup another example that the tax relief for businesses is working in Kansas.” Another wrote “The biggest takeaway here is that then didn’t bother to mention the benefits of lower taxes meaning the tax policy Kansas touts really has no bearing on company decisions.” Another wrote “Just low taxes is not a magnet for business or people wanting to move here.” Let’s look at a few statistics regarding Kansas and Colorado business taxation. In the 2016 State Business Tax Climate Index from the Tax Foundation, Colorado ranked 18 overall, while Kansas ranked 22.2 According to this measure, Colorado has a better tax environment for business, even after Kansas tax reform. Data from the U.S. Census Bureau for 2014 shows that Colorado collects $2,195 in taxes from each of its citizens. Kansas collects $2,526.3 That’s after the Kansas tax cuts took effect. Kansas would have to cut taxes much more before it reaches the low level of taxation in Colorado. The takeaway: Even after Kansas tax reform, Colorado has lower taxes. Another commenter stated “People want to live and businesses want to be located … where education is important and supported.” The writer didn’t elaborate, but generally when people say “support” education, they mean “spend” a lot on public schools. Another commenter wrote “Public schools are treated as an afterthought by our Governor and Legislature.” So let’s look at spending. Colorado and Kansas schools, according to NEA. Click for larger. Regarding school spending, the National Education Association collects statistics from a variety of sources and uses some of its own transformations.4 A collection of statistics from that source is nearby. 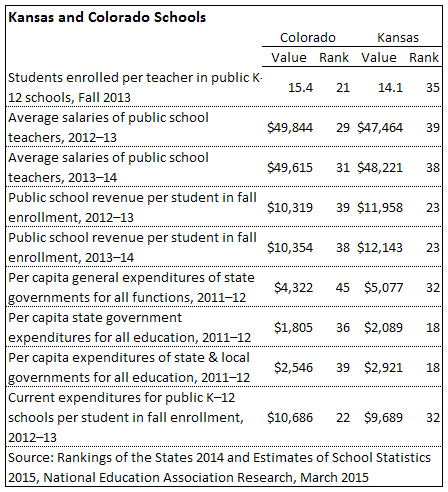 Note that Colorado teacher salaries are higher, while revenue per pupil is lower. Colorado spends more per student when considering current expenditures. Colorado has a higher student-teacher ratio than Kansas. 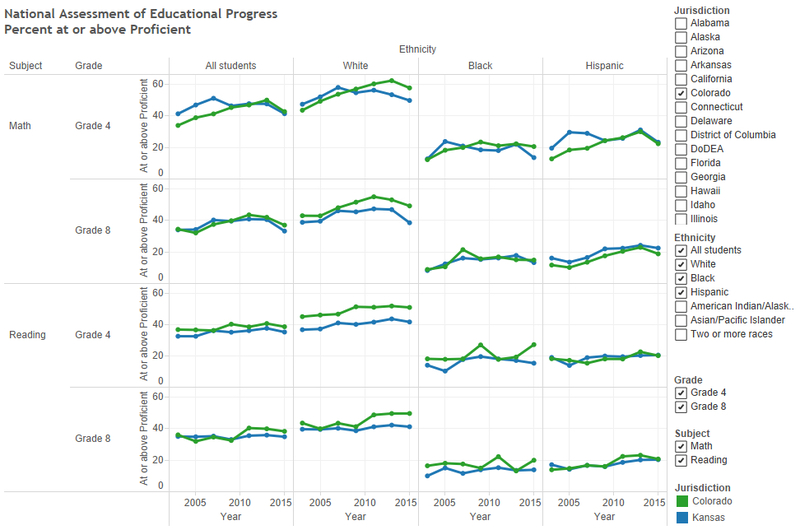 Colorado and Kansas NAEP scores by ethnicity. Click for larger. The U.S. Census Bureau has different figures on spending. 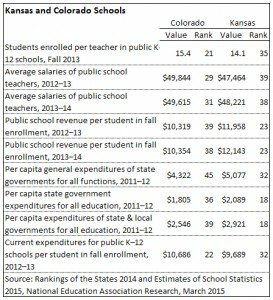 In a table titled “Per Pupil Amounts for Current Spending of Public Elementary-Secondary School Systems by State: Fiscal Year 2013” we see Colorado spending $8,647, and Kansas $9,828.5 This tabulation has Kansas spending 13.7 percent more than Colorado. Looking at scores on the National Assessment of Educational Progress (NAEP) — a test that is the same in all states — we see that when considering all students, Kansas and Colorado scores are very close, when measuring the percent of students scoring proficient or better. 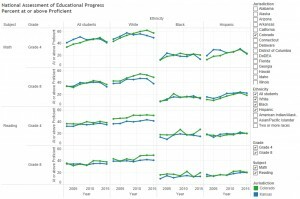 White students in Colorado, however, generally score higher than in Kansas. 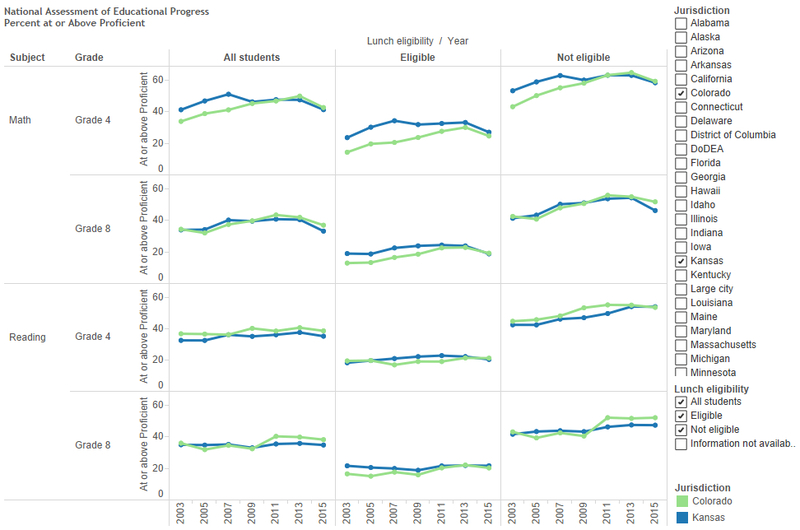 Colorado and Kansas NAEP scores by free/reduced lunch eligibility. Click for larger. Of note, Colorado has initiative and referendum. Citizens may, by petition, propose new laws and veto laws the legislature passed.8 Kansas does not have initiative and referendum at the state level. This is one way that Kansas has a more stable political environment than Colorado: Citizens have less political power in Kansas. For example, the law that made marijuana legal in Colorado was passed through citizen initiative. I think it’s safe to say that it will be a long time — if ever — before Kansas has medical marijuana, much less full legalization. Further, Colorado has TABOR, or Taxpayer Bill of Rights. This is a measure designed to limit the growth of taxation and spending. Whether one likes the idea or not, it has had a tumultuous history in Colorado, according to a Colorado progressive public policy institute.9 And if you thought Kansas was the only state that — purportedly — underfunds education, welcome to Colorado. The same report holds: “As 2016 approached, the [Colorado] General Fund remained nearly $900 million short of what it needed to fully fund K-12 education and well below what it needed to restore postsecondary education and other programs to historic levels.” This is in line with the amount Kansas school spending advocates say Kansas needs to spend, adjusted for population. Colorado also has term limits on its state legislature and elected members of the state executive department (governor, lieutenant governor, secretary of state, attorney general, and treasurer. )10 Kansas has term limits on its governor, but on no other offices. This argues in favor of Colorado having a more dynamic and less stable government. 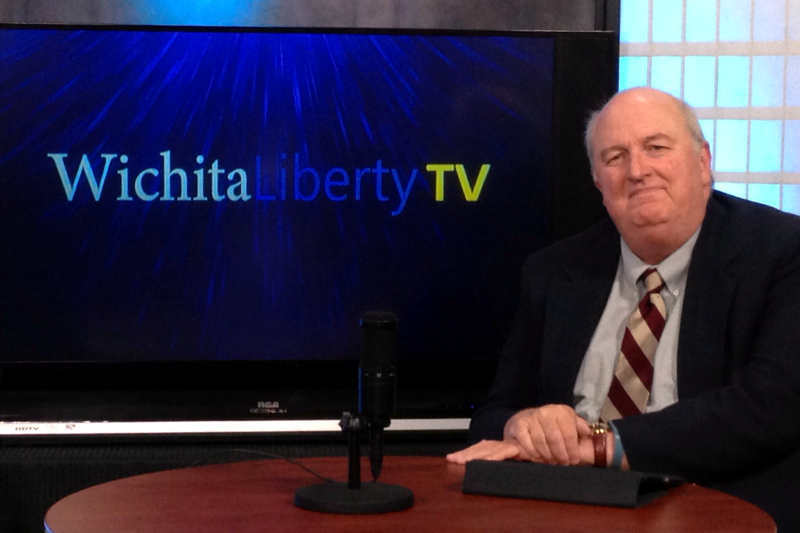 In this excerpt from WichitaLiberty.TV: What recourse do citizens have when elected officials are not responsive? Initiative and referendum are two possibilities. View below, or click here to view at YouTube. Originally broadcast May 3, 2015. For more about this issue, see Wichita has examples of initiative and referendum and Initiative and referendum. A candidate challenging a long-time incumbent for United States Senator from Kansas provides the opportunity to explore the need for term limits, and the related concepts of initiative and referendum. This is an excerpt from February 16, 2014. View below, or click here to view at YouTube. 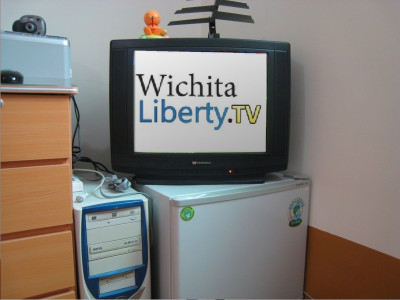 In this episode of WichitaLiberty.TV: The controversy surrounding the residence of a long-time senator from Kansas raises issues of term limits and the ability of citizens to exercise the power of initiative and referendum. Then, the seen and the unseen applied to economic development in Wichita, and why do we rely on certain experts. Episode 31, broadcast February 16, 2014. View below, or click here to view at YouTube. Paul Jacob of Common Sense with Paul Jacob and Citizens in Charge has been at the forefront of promoting citizen-powered democracy for many years. I happened to meet him a few years ago and started following his work. 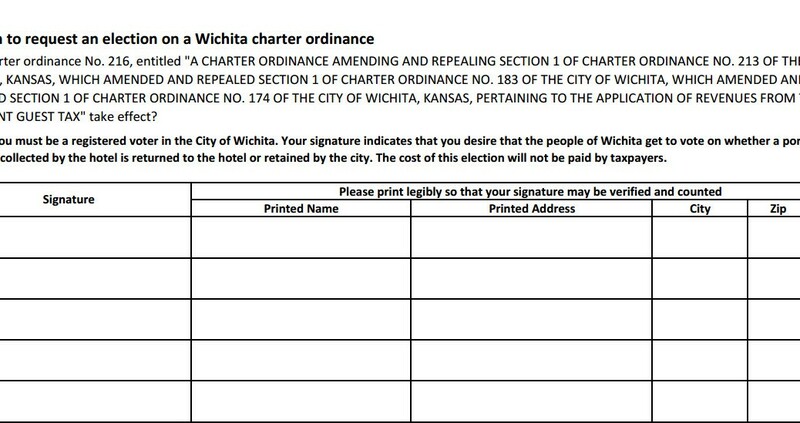 The initiative and referendum process is not common in Kansas, as there aren’t many opportunities for citizens to petition their government. So when I became involved in a referendum petition in Wichita last fall, I called Paul and sought advice. Without his helpful advice, I don’t know if we could have filed the successful petition that led to the election in Wichita this week. Voters in Wichita, Kansas, went to the polls, Tuesday, to smash a measure that would have forked over $2.25 million in tax rebates to a downtown hotel project. Those supporting the giveaway spent $300,000 to promote the deal, while opponents ponied up a scant $30,000 against it. The vote nevertheless strongly weighed against the big money, 62 to 38 percent. The Wichita City Council had enacted this “economic development” deal with the hotel developers, and that would have been the end of it … but for some pesky Wichita taxpayers. Continue reading at Common Sense with Paul Jacob. Louisville success factor may be gone. The secret sauce behind redevelopment of downtown Louisville, Kentucky may no longer be available to cities attempting to replicate Louisville’s success, such as it is. The Washington Post reports in the article Sen. Mitch McConnell’s earmark power credited for revitalizing Louisville: “The once grand downtown of this city on the Ohio River is shabby, as the nation’s old downtowns tend to be. Magnificent tall cast-iron-fronted buildings sit empty. So do historic brick tobacco warehouses, surrounded in razor wire, tagged with graffiti. But the downtown of Kentucky’s largest city also has a spectacular redeveloped waterfront featuring bike paths and open vistas, the spanking-new KFC Yum Center sports arena, and a medical complex of several hospitals that employ nearly 20,000 people, treat tens of thousands and conduct cutting-edge research. This resurgence is a result of civic vision, pride, tenacity — and the impressive earmark performance of Louisville’s Slugger: Mitch McConnell (R), Kentucky’s longest-serving senator and the powerful Senate minority leader.” … Louisville is cited as a success story by Wichita’s planners. But the earmark money that helped Louisville is probably not available to Wichita in the near term, and may not ever be available again, at least as it has been in the past. Plus, Kansas doesn’t have a senator with the clout of McConnell, and not one that calls Wichita home. McConnell lives in Louisville. Loss of earmarks lamented. In the Wichita Eagle article Earmark ban could kill some Kansas projects, well, the title pretty much describes the problem according to some. In particular, the town of Augusta would have had a difficult time affording a levee if not for earmarks. It is mentioned that earmarks are about one percent of the total federal budget. One comment writer, defending the process, wrote “Earmarks return our money to us.” To which we must counter: Why send the money away to Washington in the first place, only to have to fight to get it back? “No” to citizen-powered democracy. The Newton Kansas argues that a “practical” state like Kansas shouldn’t let its citizens place propositions on the ballot through the petitions process. The editorial says that the California budget process has led to “serious economic turmoil in that state.” It doesn’t explain why, but the writer is probably referring to the fact that the California budget must be passed by a two-thirds majority of both houses of the legislature, rather than by a simple majority as in Kansas. The editorial also says that ballot measures induce spending by proponents and opponents, and some money may come from out of state. Special interests may get involved, too. And administrative costs of adding “pages” to the ballot must be paid for, too. … I must inform the Newton Kansas that the Kansas statehouse is already overrun by special interests, out-of-state interests already spend a lot on our elections and lobbying, and anyone who has observed our legislative process up close would not use the word “practical” to describe it. … The primary reason the ruling class don’t like the citizen initiative process is that one of the first things citizens may do is impose term limits on their elected officials. Wichita IMAX may not be exclusive. In another installment of his series of love letters to Wichita theater operator Bill Warren, Wichita Eagle reporter Bill Wilson reports on the construction of Warren’s new theater in west Wichita. On Warren’s plans for his theaters in Moore, Oklahoma (part of the Oklahoma City metropolitan area), Wilson’s article reports: “IMAX? ‘Possibly, and a few other surprises down there,’ Warren said.” … Earlier this year when Warren applied to the Wichita City Council for favored tax treatment for this theater, he implied that without the city’s largesse, he’d take his IMAX theater elsewhere. In his remarks at the council meeting where the tax favoritism was approved, Wichita Mayor Carl Brewer bought into the myth that there can be only one Warren IMAX theater when he said: “A lot of other cities want this IMAX … they’re on the internet watching this city council meeting to see what we’re going to do because they’re going to make a bid for this IMAX.” … City officials said the theater would be a tourist draw from as far away as Texas. … With another Warren IMAX possibly being built nearby, Wichitans and the mayor ought to agree that we were mislead, and Wilson ought to report this in the pages of the Wichita Eagle. This entire episode is more evidence that the Wichita City Council will believe almost anything told to them, as long as it involves the possibility of economic development and jobs. Sheriff to address Pachyderms, guide tour. This Friday (December 3) the Wichita Pachyderm Club features Sedgwick County Sheriff Robert Hinshaw as the presenter. His topic will be “An overview of the duties of the office of sheriff.” Then, from 2:00 pm to 3:00 pm Sheriff Hinshaw will guide Pachyderm Club members on a tour of the Sedgwick County jail. I’ve had the sheriff’s tour before, and it is very interesting. The public is welcome at Wichita Pachyderm meetings. For more information click on Wichita Pachyderm Club. Wichita City Council this week. As this Tuesday is the fifth Tuesday of a month, the Wichita City Council will not meet. Also, the Sedgwick County Commission will not meet this week. No free market for health care. A letter in today’s Wichita Eagle claims love for the free-market economy, but not for the provision of health care. The writer claims that free markets for medical services cannot work, because the transactions are one-sided, in that the patient does not have freedom of choice. The writer also cites government success in providing military and education that “improve our society’s overall well-being,” so government should provide health care, too. … I might suggest to the letter writer that we first attempt a free market in health care before we decide it doesn’t work. Most health care is paid for by someone else, and many people who have health insurance through their employers don’t have a choice in the matter. 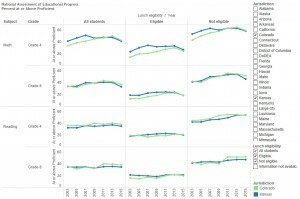 It is this regulation that causes many of the problems in the market, such as it is, and it is nothing resembling “free.” … Citing success of government education and military may not be persuasive to those who see performance of American schools on a long downward slide compared to other countries. Moran at Wichita Pachyderm: This Friday’s speaker at the Wichita Pachyderm Club is current United States Representative and Republican Party Senate nominee Jerry Moran. As a large audience is expected, please arrive by 11:45 to get your buffet lunch in time for the noon start (the larger meeting room will be used). Cost is $10, which includes lunch. Wichita, get control of incentives: Rhonda Holman’s lead editorial in yesterday’s Wichita Eagle urged caution and restraint in Wichita’s use of tax incentives — a welcome message not expected from the Eagle. One conservative wrote to me: “I am stunned to find myself to be largely in agreement with today’s editorial by Rhonda Holman. Wow.” The editorial was critical of past city policy and practice, with Holman referring to special taxing districts as “tax tricks.” On the need for public investment in downtown, she wrote “the city must ensure its use of special taxing districts is strategic, fair, farsighted and defensible.” Whether our present political and bureaucratic leadership can accomplish this is, in my opinion, unlikely. Rasmussen key polls from last week: California Senate moves from “leans Democrat” to “toss-up” … Most Americans feel Nobel prizes are political … Harry Reid’s son trails in race for Nevada governor … Cyber bullying seen equally dangerous as physical bullying. Kansas initiative and referendum: The Wichita Eagle takes a look at initiative and referendum. A focus of the article is Secretary of State candidates Chris Biggs and Kris Kobach, which is a little misplaced, as they don’t have a say in whether Kansas has I&R, although they would administer the process and Kobach has made it a campaign issue. Key takeaways: “States with initiatives spend and tax less than states without them.” Politicians of both stripes hate I&R, with Kansas Senate President Steve Morris — a big-spending, big-taxing, liberal Republican — hating the idea, according to the article. Same for Speaker of the Kansas House of Representatives Mike O’Neil, a conservative. Not reported in the article is one of the first things the people may do in states that have I&R: impose term limits on their elected officials, an idea most of the political class hates. Regulation — Baptists and Bootleggers: “Here is the essence of the theory: durable social regulation evolves when it is demanded by both of two distinctly different groups. ‘Baptists’ point to the moral high ground and give vital and vocal endorsement of laudable public benefits promised by a desired regulation. Baptists flourish when their moral message forms a visible foundation for political action. ‘Bootleggers’ are much less visible but no less vital. Bootleggers, who expect to profit from the very regulatory restrictions desired by Baptists, grease the political machinery with some of their expected proceeds. They are simply in it for the money. The theory’s name draws on colorful tales of states’ efforts to regulate alcoholic beverages by banning Sunday sales at legal outlets. Baptists fervently endorsed such actions on moral grounds. Bootleggers tolerated the actions gleefully because their effect was to limit competition.” From Bruce Yandle, Bootleggers and Baptists in Retrospect. A podcast on the topic is Bruce Yandle on Bootleggers and Baptists. Obama fails education: From Three Reasons Obama’s Education Vision Fails at Reason: “While he brags constantly about his Race to the Top initiative, in which states competed for $4 billion to fund innovative programs, he’s spent more than $80 billion in no-strings-attached stimulus funds to maintain the educational status quo.” Obama also killed a school choice program in Washington, and has snuggled up to the teachers unions with a stimulus bill to preserve and add union teacher jobs “despite the fact that there are already more teachers per student than ever.” The status quo describes outgoing Kansas Governor Mark Parkinson and his education “vision.” Not that presumptive incoming governor Sam Brownback is a radical on school reform, however. His education plans are quite tepid and not likely to produce the results Kansas schoolchildren need. Wichita Eagle Opinion Line: “If Kansans want lower taxes and less government, why are there so many homeowners’ associations here?” I guess the distinction between government and voluntary action escapes this person. Following is an op-ed by Paul Jacob that recently appeared in the Wichita Eagle, although this is the version he sent to me. Jacob is president of Citizens in Charge Foundation, a national organization that promotes the rights of initiative and referendum. The citizens of Kansas enjoy neither of these. Fort Hays State University Professor Chapman Rackaway is entitled to his opinion that “Voter initiative sounds good but is bad idea” (September 14 Wichita Eagle), but not to make up his own facts to buttress this viewpoint. Rackaway uses inaccurate claims about California’s initiative process to argue against Republican Secretary of State candidate Kris Kobach’s popular proposal to allow Kansans to petition issues onto the ballot for a statewide vote. It’s instructive that the professor focuses on far away California, ignoring the states surrounding Kansas — Colorado, Missouri, Nebraska, and Oklahoma — all with voter initiatives. Note that a recent state ranking by the American Legislative Exchange Council placed all four neighboring initiative states ahead of Kansas for economic performance from 1998-2008. Still, Rackaway’s assertions about California are not true. For instance, the professor states, “A typical ballot there has 50 or more initiatives…” The most initiatives ever on a single California statewide ballot? Seventeen. Back in 1914. Rackaway also cites several “silly initiatives” that are on this year’s California ballot. The only problem being that none of the initiatives mentioned by the professor are actually on the ballot. Oops! “If we had 75 percent voter turnout and an electorate committed to informed participation,” wrote Rackaway, “the initiative would be a worthwhile proposal.” But in his view, Kansans currently aren’t up to the job of making decisions. Both factually and otherwise, the esteemed professor is sorely mistaken. Kansans deserve the right to vote on the issues that affect their lives, especially on reforms like term limits opposed by self-serving politicians. Thank goodness Mr. Kobach is standing up for the average citizen. Citizens in Charge Foundation — a transpartisan national voter rights group focused on the ballot initiative and referendum process — has released its 2010 Report Card on Statewide Voter Initiative Rights. Those familiar with Kansas will not be surprised to learn that our state scores poorly, as do many other states. As governments have grown at local, metropolitan, state, and federal levels, the power of entrenched factions has also grown, vis-à-vis the citizenry. Traditional representative government has proven unreliable in restraining itself constitutionally, often to the point of uniting all branches of America’s distributed powers against the very people it was meant to serve. Institutions of direct democracy have evolved to help restore this balance of power, in effect fulfilling a basic promise of republican governance: The right to petition government. Initiative and referendum thus serve as an expansion and perfection of one of the most basic principles of a limited republic. The local rights referred to are limited. The bar for local I&R in Kansas is set pretty high, and it’s difficult to exercise these rights. Allow citizens to propose state constitutional amendments. Allow citizens to propose state laws. Allow citizens to put acts passed by the legislature to a referendum vote. 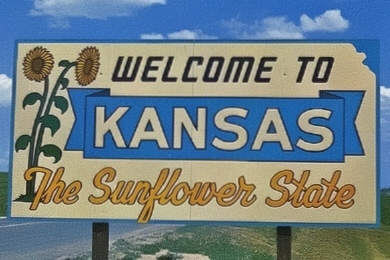 Kansas Governor Joan Finney pushed for initiative and referendum in 1991, but the measures, which require amending the Kansas Constitution, failed to get the required two-thirds vote in the Kansas House of Representatives. Sometimes we in Kansas like to poke fun at our neighbors to the south in Oklahoma. I’m sure they do the same to us. But one way in which Oklahoma has Kansas beat is in Oklahoma citizens’ ability to petition their government through the process of initiative and referendum. It’s not possible to do this in Kansas, at least for our state government. And Oklahomans have to be vigilant to make sure the right to petition isn’t taken away from them. It’s a continual effort. Certainly, I’m encouraged to see Oklahoma citizens win major victories this year. The legislature passed a constitutional amendment to lower the signature requirement. That amendment will appear on the ballot next year. Legislators also passed SB 800, which mandates that challenges to the wording of a petition be dealt with prior to signature gathering. The governor signed SB 800 into law. But it’s disappointing to see the governor kill HB 2246. Most importantly, HB 2246 would have increased the time citizens have to gather petition signatures from a scant 90 days, currently, to a full year under the language of the bill. This is the most important reform needed in Oklahoma and one we’ll continue to push. While freedom-loving Oklahomans have to work each year to make sure their right to petition their state government isn’t watered-down so much as to be useless, we in Kansas have no such concern. That’s because we can’t petition our state government. What would it take for Kansans to gain the right to petition their state government? We’d need to amend the Kansas Constitution. That requires passage of the amendment by a two-thirds majority of both the Kansas House and Senate, and then passage by a majority vote of the people. Legislators don’t like to share the power to make laws with citizens. Unfortunately, since legislators would have to pass a petition law by a difficult to achieve super majority, Kansans may have to continue to wait for the freedom and power that Oklahomans enjoy. From the Sam Adams Alliance. Chicago, June 8 — When Americans went to the polls in November and continued casting ballots during the 2009 off-year elections, they turned to Ballotpedia (www.ballotpedia.org) to get objective information about candidates and ballot initiatives. The California pages pertaining to Proposition 8 and the more recent ballot measures alone garnered more than 1.3 million page views. That is why the Ballotpedia community is celebrating its 10 millionth page view. The role Ballotpedia has played in the political process can be measured in the popularity of its pages. An internet search (Google) of California 2008 ballot measures, including Proposition 8, demonstrates the importance of Ballotpedia, as its pages consistently rank in the top three most visited sites. As a wiki-based website, anyone can contribute and edit content, which means the people are responsible for researching and adding information that is often hard to find. The Ballotpedia community is not resting on its laurels. Contributors are adding information every day, including recent legislative and gubernatorial action pertaining to ballot access in Nevada and Oklahoma, respectively. Both states have made the citizen initiative process more difficult. Ballotpedia is a free, collaborative, online encyclopedia about elections, ballot measures and access, petitions and ballot law, recalls, school and local ballot measures, and state legislatures. Launched in May 2008, Ballotpedia is a project of the Sam Adams Alliance. A Wall Street Journal editorial explains the recent development in the case of Paul Jacob and two others in Oklahoma. This case is of interest for a few reasons. First, I know and like Paul Jacob. He’s been at the forefront of the fight for term limits. The Oklahoma case stems from his advocacy of initiative and referendum, something we don’t have in Kansas. Second, this case illustrates how government officials, in this case the attorney general of Oklahoma, can misuse their office and power for political gain. We in Kansas can only hope that our good neighbors to our south see through Drew Edmondson’s actions and refuse to elect him to any office. Paul Jacob is president of Citizens in Charge. 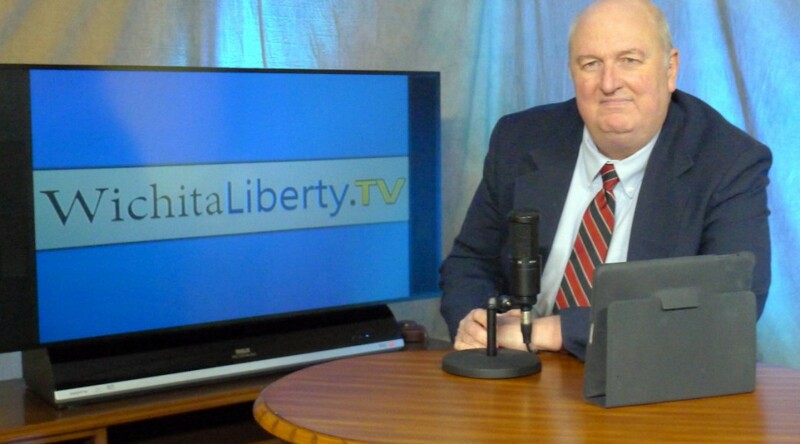 His commentary is found at Common Sense with Paul Jacob and Townhall. The Journal editorial is Still Oklahoma’s Most Wanted. On Saturday I traveled to Oklahoma City to attend “Reforming the Reform Process: How to Restore Oklahoma’s Initiative.” What I learned is that Oklahomans are concerned with reforming a valuable citizen right that doesn’t exist at all in Kansas. The initiative process allows citizens to place a question on a ballot to be voted on by the people. This is helpful when the legislature or governor refuse to pass laws that the people want. Referendum allows for laws that have been passed to be revoked. In both cases, citizens usually have to gather a large number of signatures in order for the measure to make it on the ballot. The entrenched powers in states usually don’t welcome initiative and referendum. These powers that will resist I&R are not only legislatures, but also bureaucrats and organizations like teachers unions that benefit from current political arrangements. They’ll do whatever they can to defeat citizen efforts. For example, I learned of an effort where a group spent some $750,000 to gather signatures on a petition, only to have the effort invalidated due to a technical defect in the language on the petition. The measure, dealing with educational reform, was opposed by the Oklahoma State School Boards Association. That group, and others, sued to have the petition effort invalidated. They were successful. This illustrates a problem that citizen groups face. They may spend tremendous effort and money, only for it to be wasted. In most states, the process is stacked in favor of entrenched interests. Kansas has no initiative and referendum at the state level. This is only one are in which Kansas lags behind the standard set by other states. To learn more about the initiative and referendum process, visit these sites: Citizens in Charge Foundation, Initiative & Referendum Institute, and Ballotpedia.